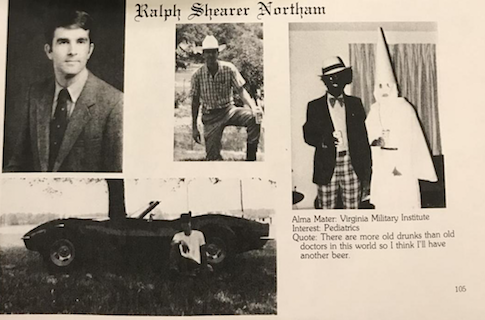 Democratic Virginia governor Ralph Northam's medical school yearbook page contains a picture of a man in a Ku Klux Klan hood next to a man wearing blackface, according to a picture that surfaced on Friday afternoon. The image of Northam's Eastern Virginia Medical School yearbook page was first released by Big League Politics, and quickly confirmed by the Virginia-Pilot and the Washington Post. Northam graduated from the school in 1984. In addition to the photo, the yearbook page contains three pictures of Northam and the quote, "There are more old drunks than old doctors in this world so I think I'll have another bear." It has not been confirmed whether Northam is either the man in blackface or wearing the Ku Klux Klan robes. Northam apologized for the "clearly racist and offensive" photo, but said that he would work to regain the trust of Virginians. The Republican Party of Virginia called on Northam to resign. This entry was posted in Politics and tagged Ralph Northam. Bookmark the permalink.